In the end in turned out to be much-a-do about nothing. After all was said in done there was a bizarre, yet happy ending in the fact that the 6 year old Colorado boy was found safe. Not in the balloon, but instead hiding in his home. He was in the attic the entire time while every news outlet speculated that the boy was in the hot air balloon. 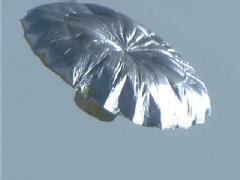 Authorities said the silver helium balloon, 20 feet long and 5-feet high, at approximately 7,000 feet above the ground while adrift. The balloon was found more than 90 minutes later in a field near Colorado Springs. He was in a box. In the attic. The whole time. “I played with my toys and took a nap,” Falcon told a group of reporters outside his home Thursday afternoon. “I’m sorry I yelled at him,” added Heene, tearfully hugging the boy. It turns out that the little boy was never in the balloon at all. He had been hiding in a cardboard box in the attic of the family’s garage the entire time. Kind of an anti-climatic ending to what was first thought to be breath taking drama. However, in the end thankfully the boy was never in the balloon. Wolf “I lost on Jeopardy baby” Blitzer? Balloon Boy was bouncin’ off the walls. MY DAD’S THE MAYOR! MY DAD IS MAYOR!!!!!! Someone needs some counseling with Dr. Laura. You’ve probably never heard of Richard Heene (pronounced HEE-nee). But I’m willing to bet that, after October 3, you will. I have known Richard for over 20 years. He is an amazingly creative human (now turned mad scientist) who insists on repeatedly proving that there is a very fine line between genius and insanity. It’s impossible to paint a true picture of Richard for you. I could tell you about the cocker spaniel he gave a purple mohawk in the 80s and pronounced a “Punker Spaniel.” I could tell you about the two books he’s published, The Herp-AIDS Detector/Deflector Kit and The Official Offensive Driving Handbook (designed and printed by yours truly). I could tell you about how impressed my son Jimmy was when, at age 10, I took him to visit Richard in the abandoned house he was occupying. Jimmy was especially taken with the boarded-up windows and the Mickey Mouse cartoon graffiti on the interior walls. I could also tell you how Richard is convinced that he has found the secret of an anti-gravity device in the cyclonic action of tornadoes (watch this news report). At the same time I could tell you about scores of amazing ideas, products and projects Richard’s fertile mind has created. Projects like Boxtime, the incredible children’s television show he conceived and produced, that was so good Elmer’s Products invited us to present it to their executive team at their headquarters in Columbus, Ohio. And I could send you a copy of the scientific paper he recently wrote which was just published in the Digest of the National Weather Association. But I’m sure nothing that I could tell you will possibly match the explanatory value of the premier episode of this season’s Wife Swap television show. Somehow Richard and his saint-of-a-wife Mayumi were chosen to appear. Not surprisingly (to me at least), the resulting video was so amazing that the network executives selected their episode to be the very first one aired this fall season. Even if you have never watched this show before, I implore you to put it on your calendar, set your TIVO, do something! But DO NOT miss this show, Friday October 3, 2008 at 8:00 p.m., 7:00 Central Time on ABC-TV. Check your local listings. I have not seen so much as a preview of the show (and Richard won’t give me even a single morsel), but take it from Uncle Frankie: HEENE WILL NOT DISAPPOINT! P.S. We’ll probably start seeing some juicy bits in ads for the show in the next few days. So, he appears to be an effin loon… and the kid did him in on LKL with Wolf! Real Aliens from outer space and conduct a full interview with them. Are there really aliens, like Greys, and Blues? I love going fast in cars, motorcycles, airplanes and rockets. I am into magnetic fields and gravity propulsion. Positive rather than negative energy. I don’t believe in anything I can’t eat wth a fork or cut with a knife. Music	Rock and roll, techno, R&B, Blues, Classical. Movies	Anything with a good story. That’s right… a good story. I’m not into horror films unless they are extrememly creative. Are we in a Matrix? Books	I only read books that are extra informative and not by some self serving individual who likes to babble about useless personal experiences encompassing their own lives. Heroes	Anyone who can stand up to the system, and non-conformists. Anyone who can honestly question reality. The look on his face and his verbal bumbling after his son’s comment says it all. Maybe this guy could do a show about teaching your kids to lie to police and national television while running up huge bills for others. And what about this “high voltage” business inside the balloon. If it was truly a high voltage device, what were his kids doing playing around it? Someone needs to ask the question – like perhaps DHR. Glad that the little boy is fine, but just wondering who is going to pay for all the public resources that were expended for this “stunt”? smelled like a stunt to me from the beginning. still smells like a stunt to me. Just saw the LKL video on Fox News again. After the boy says “You said, we did it for the a show”, the dad sighes and says “man”, followed by the two brothers who immeadiately look to mom as she says “No!”. You just can’t make this stuff up!!!! Makes me wonder, I read that his brother video taped him getting into the basket of the balloon. How would you just happen to have a video camera on hand at that very moment? Richard said he had to walk away from the TV because he was too upset watching it. If it were your son wouldn’t you be glued to the screen? Has anyone asked how someone so little managed to get himself into the attic, don’t you think he had to of had help? Saw the video of them chasing the tornado and Richard got out of his vehicle while his wife is filming and saw the over turned tractor trailer, got back into the vehicle and said to the kids isn’t that cool and they said “yea”. OMG, no one even cared to see if the driver was OK or not and obviously needed help getting out. this was taking place. Falcon said his Dad yelled at him, so he hides out in the garage for 5 hours. And then Falcon said he did it for the show. That comment in itself should definitely be investigated. So Richard calls the FDA because he thinks his son is in the basket. Or was it because he didn’t want anything interfering with his experiment on how high it would fly, how far and how fast it would go. That way someone else could do the filming and do the tracking and he could get his answers. moment, right after the dad said MAN! Falcon ripped a hellacious buzzard on live national television. The Falcon buzzard comes at :44 seconds into the clip. It was a total scam for TV ratings !!! I hope he has to repay every penny spent on the stunt !!! “I got people e-mailing me, calling me; they’ve got a lot of questions, and I don’t know how to quite frankly answer any of them other than I’ve got a box,” Richard Heene said about 10 a.m. He said he’d answer the questions later Saturday night. Richard HEENE, Heene – rhymes with WEENIE. The dude is an A-1 GOOBER – FIRST CLASS. No wonder the two brothers turned to look at the mother! It wasn’t because brother let the cat out of the bag. It was because brother cut one on national television! And dad says, “Man”. If he was smart he would use this as his defense.